Achieve a leaner, healthier body with superior, all-natural proteins+. 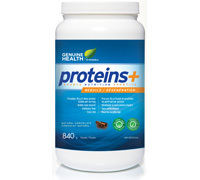 Protein is vitally important for overall health, including easier weight loss, increased metabolism and lean muscle. Containing alpha+™ whey protein isolate, proteins+ provides the purest, absorbable source of protein with digestion enzymes, and no artificial ingredients. As a mid-day snack, pre or post exercise, enjoy proteins+ every day for a leaner, healthier body – naturally. To increase lean muscle, improve exercise recovery and immune support. 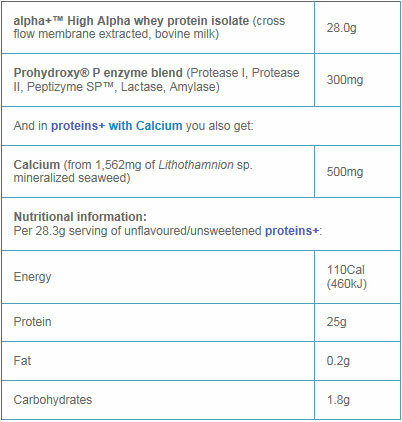 mix two scoops (28.3g) of proteins+ in one cup (250 mL) of pure water or juice. Take once daily or as needed. Note: proteins+ contains no artificial colours, flavours, sweeteners or preservatives, corn, egg, wheat, gluten, soy or yeast. Caution: Do not use if you are pregnant, or if you are allergic to papaya, pinapple, Aspergillus, mold or milk/milk products. Consult a health care practitioner before use if you have a medical condition, if you are taking prescription medicines (eg. blood thinners), or if you have impaired liver or kidney function. Discontinue use if you experience hyperintensitivity/allergy.